The Hastings Half Marathon is a popular race, and the 33rd edition will be no exception. Following a flurry of late entries – people seem to think the weather will be good next weekend – there should be well over 3,000 taking part, Eric tells HOT. But what is different this year is that there will be no Kenyans, who have dominated the race in recent years. In 2016 the men’s race was won by Robert Mbithi from that nation, who finished more than six minutes ahead of the next runner. Now the Kenyans have gone in pursuit of bigger prizes in France and Spain, leaving the door open for Brits to shine. In fact there are some very good local athletes who could well spring a surprise, Eric says. Look out for Rhys Boorman, who came third last year, Garry Foster, Kieran Booker and Jeff Pyrah. The starting gun is fired at 10.30am. But they will have to contend with the “class act that is the Blackburn Flyer.” This is Ben Fish, who was the last home-grown winner of the race, back in 2010. He’s a man in form, having won the Bath Half Marathon last weekend. The ladies race is wide open – we could have a local winner with Karen Murdoch, who in October won the Way To Hastings run which was held as part of the 950th anniversary celebrations of the Battle of Hastings. As usual it’s a very international and cosmopolitan entry, Eric says, with big contingents of runners from our twin towns in Belgium and Holland, as well as entrants from nearly all the European countries, New Zealand, Australia, South Africa, the US and Canada. Local communities such as the Pestalozzi international village are well represented, as are charities such as St Michael’s Hospice (who know of 50 supporters running to date but are still counting), Macmillan Cancer Support and not least the local RNLI, who will be holding a cheerleading stop en route. There will also be the usual bunch of fun runners, including the Round Table pushing their Round Table barrel. The starting gun will be fired at 10.30, but it will be preceded at 10 o’clock by a collective warm-up, with aerobic exercises accompanied by some very beaty music coupled with the 1066 Pipes & Drums marching up and down the start area. 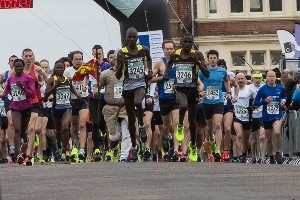 The 13.1-mile course starts in Sea Road in West St Leonards, makes its way uphill via Harley Shute Road and Queensway to the Ridge, continues east to Ore and then comes back down to the sea and along the promenade back to Sea Road. There will be plenty of entertainment to encourage the runners as they circle the town, including numerous choirs, discos and bands. Community choir Oresome Sounds will be performing at the nine-mile point in Ore and a Dolly Parton tribute band outside the Azur restaurant. It’s a massive organisational task, but one with which Eric and his cohorts have years of practice. Warning signs have been posted to keep traffic off the route between 10.30am and 1pm and around 190 marshalls will be deployed at junctions to make sure they do. Avoid the Bexhill-Hastings link road, says Eric – it will be closed at the Bexhill end. However, the A21, Battle Road and the town centre will all be completely open. Along the route there will be drinks stations run by scouts, guides, the ATC, the army and the sea cadets, and first aid posts staffed by Wealden Ambulance Services. There are plenty of prizes on offer, including £1,000 from Hastings Premier Chauffeurs for any male or female runner who can beat the respective course record. Only a few awards are made on the day, Eric says. The bulk will be presented at a special prize-giving evening to be held on 16 April at Azur, when the guest of honour will be local international heptathlete Elise Lovell. And don’t forget the junior version! 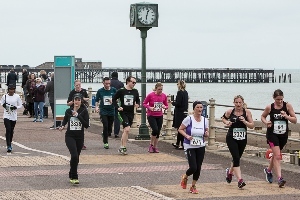 This is a 1.5-mile mini-run for youngsters between the ages of nine and 16, starting at 10.45 from a point just west of the pier and finishing at the half marathon finish in Sea Road. Hastings Half Marathon Sunday 19 March, starting 10.30am in Sea Road, West St Leonards. You can enter the race online up to midday on Friday 17 March, or on the morning of the race at the start location – if places are still available, Eric says.